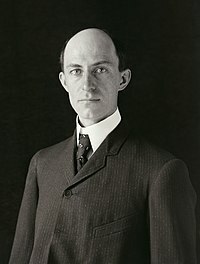 Ceapadóirí agus ceannródaithe eitlíochta ab ea na Deartháireacha Wright (Orville Wright agus Wilbur Wright). Cheap siad an t-eitleán. Deartháireacha Meiriceánacha a saolaíodh i nDayton, Ohio is Millville, Indiana faoi seach. Mhúscail léirithe d'fhaoileoirí a suim san eitilt sna 1890idí. Thógadar aerárthaigh ina siopa deisiúcháin rothar i nDayton ar dtús. Chuireadar feabhas ar fhaoileoirí, agus faoi dheireadh chuir Orville inneall i gceann díobh. Tar éis an chéad fhaoileora, a chruthaigh George Cayley i 1853 agus a thaispeáin gur féidir árthach nearnhfhuinnmhithe is troime ná an t-aer a eitilt, chláraigh na Wright a n-inneall eitilte agus chuir siad paitinn air ar an 23 Márta 1903. Creidtear gurb iad na daoine a rinne an chéad eitilt faoi chumhacht innill riamh in Kitty Hawk, Carolina Thuaidh i Stáit Aontaithe Mheiriceá ar an 17 Nollaig, 1903. Ach ní raibh duine ar bith ann chun é a chruthú. Tar éis an éachta seo, dhear siad eitleáin fuinnmhithe eile sna blianta ina ndiaidh. Fíordheimhníodh na heitiltí sa bhliain 1908 don chéad uair (ach fíordheimhníodh na heitiltí a rinne Alberto Santos-Dumont sa bhliain 1906 don chéad uair). Bhunaigh na deartháireacha Wright comhlacht déantúsaíochta aerárthach sa bhliain 1909. Mhúin na deartháireacha Wright an eitleoireacht do Chance Milton Vought, agus bhí sé mar phríomhinnealtóir i gcomhlacht Wright gur bhunaigh a chomhlacht féin, in éineacht le Birdseye Lewis, i 1917, mar atá Lewis & Vought Corp.
Tugadh an leathanach seo cothrom le dáta an 23 Márta 2018 ag 07:14.